Enjoy clearing tiles the usual way in Classic, exchange tiles to make matches in Swap, locate the like set of tiles in Pair, and find the two corresponding tiles in Logic, plus three other unique styles of play. Each offers a tantalizing challenge filled with special power-up tiles, unlimited hints, and helpful shuffles. Filled with beautiful scenery, relaxing music, and fascinating facts, this game will keep you enchanted. Download free full version game today and embark on a soothing vacation around the world with this Mahjong endeavor. 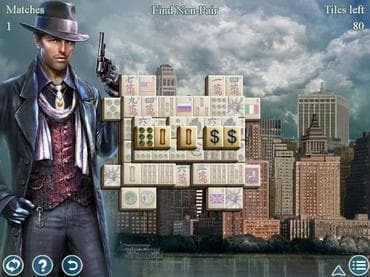 Free Game features: - Complete over 140 layouts by playing seven different Mahjong variations; - Use special power-up tiles, unlimited hints, and helpful shuffles; - Earn extra bonus points by matching tiles quickly and in succession; - Visit the New York, London, and other wonderful destinations! If you have questions about Greatest Cities Mahjong game, please contact us using this form.